THE NEW YORKER … an important new entry … Heindel plays all Bach's pieces for the instrument, and they suddenly make sense in a way they never have on harpsichord or lute. STEREOPHILE … idiomatic and plausible readings of the major “lute works” … I'd suggest it even to the most avid fret-fanatic. After all, how frequently does a recording change your perspective on long-term favorites? DIAPASON ( France ) …This performance is a major step forward in terms of both its interpretive and its historical aesthetic. THE AMERICAN ORGANIST … exquisitely performed … Heindel's playing of Bach is certainly among the best available. ALTE MUSIK ACTUELL ( Germany ) … a superb CD … Heindel pulls off an outstanding achievement. 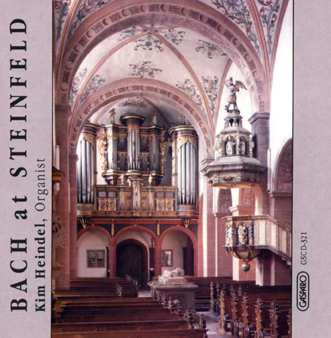 HARPSICHORD & FORTEPIANO ( UK )… Kim Heindel plays with a combination of rhythmic poise and subtle phrasing I have seldom heard on record … this CD is a must for anyone interested in Bach's keyboard music. SOUNDSCAPES ( Australia ) …These Bach masterpieces sound comfortable and convincing, particularly with Heindel's tasteful and intelligent performances. Dorian is to be congratulated for producing this long overdue recording. GITARR OCH LUTA ( Sweden ) … Kim Heindel … plays quite convincingly and does this wonderful music complete justice. A recording I can warmly recommend! CD CLASSICA ( Italy ) … Interpretation: Excellent - Exceptional … Apart from the mere fascination of hearing a sound thought to be long-lost in antiquity, the interpretation is one of the best ever heard. AMERICAN RECORD GUIDE … Heindel's playing is thoughtful and articulate … The [plaintive flute] tone itself and Heindel's subtle shaping of the line [ Recitativo, BWV 594.2] yields a vocal quality that is quite uncanny. AMERICAN ORGANIST … Heindel's playing is clean, rhythmic, and a joy to listen to. He combines an excellent sense of overall breadth with a marvelous feel for the individual phrase, and the technique to shape the music to his conception of it. This is a wonderful record. 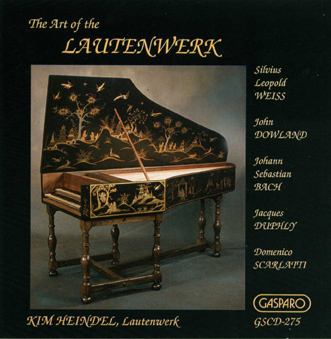 EARLY MUSIC … intriguing … very convincing … Heindel proves a persuasive advocate of the lautenwerk's ability to combine the gut-strung lute's gentleness and beauty of tone with the keyboard's facility. GRAMOPHONE … 1990 Critics Choice ... Heindel plays in excellent style, with well-judged tempos, a controlled measure of rubato, and adds tasteful embellishments to the Bach. I have greatly enjoyed hearing this music, dressed in fresh sonorities and so winsomely played, and I suggest that you share that pleasure. 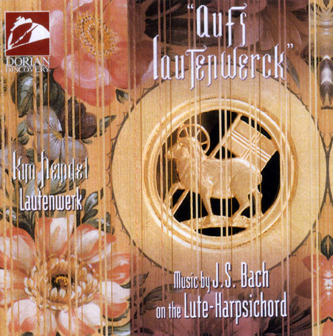 DIAPASON … It would be hard to imagine a more persuasive proponent for the lautenwerk than Kim Heindel … This excellent recording, which has vividly captured subtleties of both instrument and performance, will introduce the sound of the lautenwerk to a much larger audience, and is sure to make many new friends for the instrument. InTUNE ... utterly musical playing ... All the works are top class and all the playing at the highest level ... Highest recommendation.